Colour Temperature is a new concept that to be quite honest was of no real relevance when we just had filament light bulbs. This was because the light was created by heating the filament with electricity and it glowed white hot which actually produced a light with a warm white colour and this was all we had. Now with the introduction of LED bulbs there is far more variation and choice as the LED lamps can be made with any colour temperature. 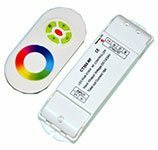 Colour Temperature is measured in the unit Kelvin and is the standard method for measuring the colour of light emitted from a lamp. The reason why this colour measurement is actually using a temperature unit the Kelvin is because it is correlated by observing the colour of a piece of steel when heated to the prescribed temperature. The piece of steel will glow a different colour depending on the temperature it is heated to, varying from red hot through yellow to amber then white and finally a blueish white. The colours of relevance to light bulbs start from 2700K which is a yellow warm white colour, then increasing to a fairly white colour at around 3500K which is similar to a halogen bulb. As the temperature is increased further to 5500K then the colour is similar to the light outside on a sunny day and then finally to 6500K which is the light colour on an overcast day. The aspect which is then confusing to start with is that a colour temperature of 2500K would be specified as a very warm white colour but as the temperature then increases to 4200K then this is designated as cool white even though the temperature has increased! So, you just need to remember that the cooler light colours have a higher Kelvin measurement. The selection of light colour is ultimately personal choice but there are some factors which should be considered. A warm white light colour is far softer on the eye and creates a warm ambiance and accordingly is normally the choice for interior domestic spaces. Additionally the warm white colour will not show up every detail on a surface and is more flattering when peoples' faces are seen as and fine wrinkles or blemishes will not be so prominent and visual skin toning will look better. In contrast the cool white light is much better for visual clarity and therefore is the normal choice for office environments and work environments where vision is of paramount importance. At the top end of the scale there is daylight colour which is the best for vision and accordingly is normally chosen by people who are reading and artists because it shows colours as they would be seen outdoors. The fact that daylight white gives improved vision means that it is the natural choice for the partially sighted and care homes.